Nice pictures, thanks for sharing. Thanks for the info! Can you tell I don't know much about the bigger kites? On page two; the bat kite; any idea who flew it. I made one, half as big again, but it flyes horrible. Would like to get in touch with pilot to see if he made any bridle mods. Thanks for the pictures Jared! First time they've been flown in the US, I think. Very nice....Jared. 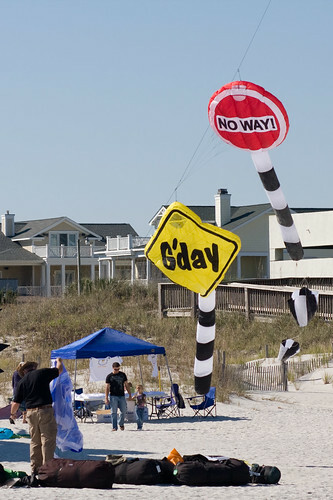 We were down at Gulf Shores...winds from Ida were 16-18....lol. Still, we had a great time. That is pretty frickin' awesome. 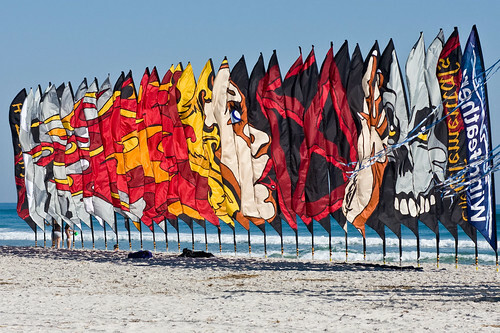 Best photo I've seen of that banner series, usually the wind is less kind so the image gets a bit distorted. Nice job, Jared! And I'm jealous of your close proximity to Kite Party I guess that's why we have the Cape Fear festival on the east coast. Jared, great pics. Thanks for sharing. What part of NC are you in? Wufer, That would be Scott from Cary NC on the Bat kite. IIRC that is an old original version that he has with no bridle mods. I've flown it a few times. It flies nothing like the revs you and I are more used too. Very tippy from side to side, requires a lot of concentration to keep it oriented, spins like crazy, stopping the spin is another issue.